If your business operates in a specific geographic area, then you need to make sure that your business contact information is listed properly in relevant local directories. This is important for your Canadian local SEO results on Google and other search engines. 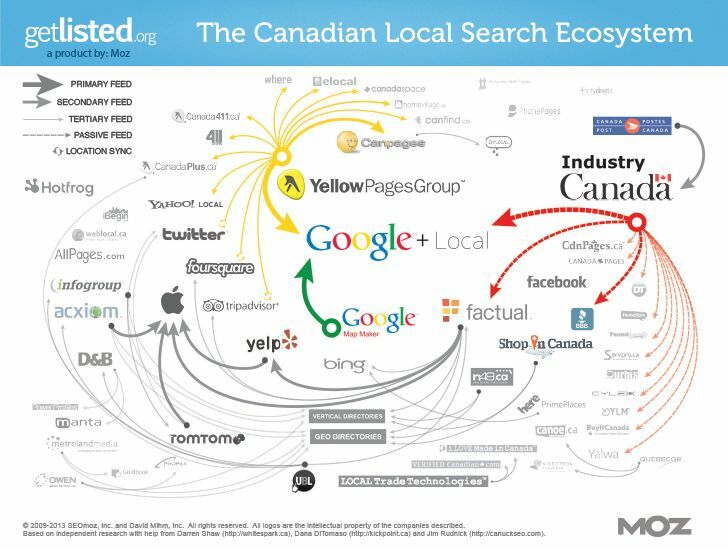 The guys at MOZ created a nice infographic that summarizes the Canadian local SEO ecosystem. This infographic shows how directories share and verify your business’ contact information. Having your business information appear in different directories on the Internet, will be used by Google for “citation” purposes. In other words, to verify that your business is real. Before you begin submitting your business details to local directories, make sure you have all contact information ready. Important – make sure to use the exact same contact information consistently across all directory submissions.